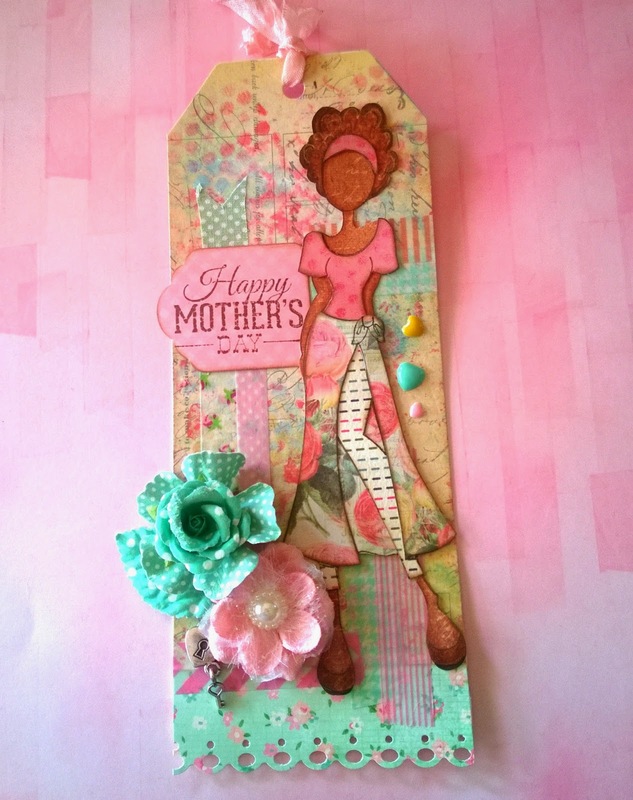 Julie Nutting Designs: Happy Mother's Day! Hey...where did April go? I completely forgot to do a tag for April and I had the cutest idea in my head! It was a crazy, busy month for me with a bad cold thrown into the mix. I was happily making some samples for package photos for some awesome new products coming out in July. we also had some last minute ideas for a release in October that I had to squeeze in. I just received the prototypes and I promise much fun will be had by all who purchase these little gems! So all of a sudden it's May. Didn't we just pack Christmas away? Here is my May tag, made simply with the new Prima Bloom Sprays and lots of washi tape. Had so much fun with this. Did you all make your Mother's Day cards or buy them? Adorable tag Julie! I was wondering when you were going to do a new tag! She is one of my favorite doll stamps and I love how you used the washi tape. What did you use to make her tights? They are so cute. I was not able to make my Mother's day cards, so I had to purchase them. I did not allow myself enough time to make the ones that I needed. Next year I will start ahead of time! I would like to find out how to order the Chipboard book with the paper doll embossed on the outside cover. Rene, where ever Prima products are sold. Just wanted to share the fun news that I was published in the newest Feb/March issue of Scrap and Stamp Arts with an article on stencils and one of the cards in the article features my favorite Julie Nutting Prima Doll, Kate. Check out page 50 if you see a copy:) Happy Holidays! that's great Karen, can't wait to seeit!